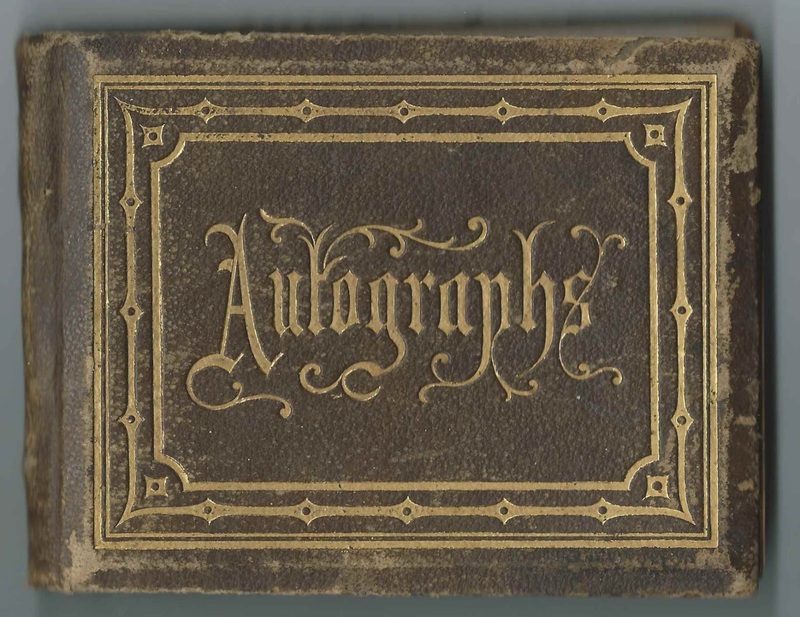 1870s autograph album that belonged to Georgie Humphrey of West Haven, Connecticut. Georgianna Humphrey, born June 21, 1855, on Staten Island, New York, daughter of Joseph Aaron Humphrey and Hester Emily (Sharrot) Humphrey; the family moved to West Haven, Connecticut; Georgianna married Hugh Caldwell in 1876; she died in 1914. Georgianna and Hugh are buried in the Oak Grove Cemetery at West Haven, Connecticut. George Washington Humphrey, Sr., born May 24, 1861 at West Haven, Connecticut, son of Charles Edward Humphrey and Cecilia Josephine (Sharrot) Humphrey; married Angelina Martha Hitchcock in 1883; he died in 1933. George and Angeline are also buried in the Oak Grove Cemetery at West Haven, Connecticut. Georgianna Humphrey and George Washington Humphrey were paternal cousins. In fact, there were family connections between many of the inscribers. See The Humphreys Family in America compiled by Frederic Humphreys, M.D., and others, published in 1883. 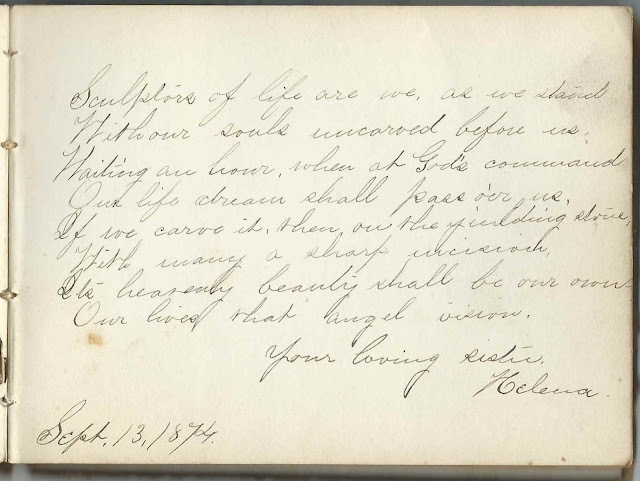 The page below, inscribed "To Artie from her mother", throws another monkey wrench into the dilemma. Did Georgie have another nickname? Another page was inscribed by Helena to her sister. I didn't find a Helena as the blood sister of either Georgianna (Humphrey) Caldwell or George Washington Humphrey. And neither Georgianna nor George was married by 1874, when the page was inscribed, so that would rule out a sister-in-law, unless Georgianna had an earlier marriage that I missed. It's possible that the use of "sister" was an honorific due to a close friendship or religious association. Hopefully a reader will have insights to share. The album measures approximately 5-1/4" by 4" and contains the inscriptions or name stamps of 15 of Georgie's relatives and friends. If you can tease out Georgie's, or Artie's, identity from the clues provided in the inscriptions, listed farther below, please leave a comment or contact me directly. 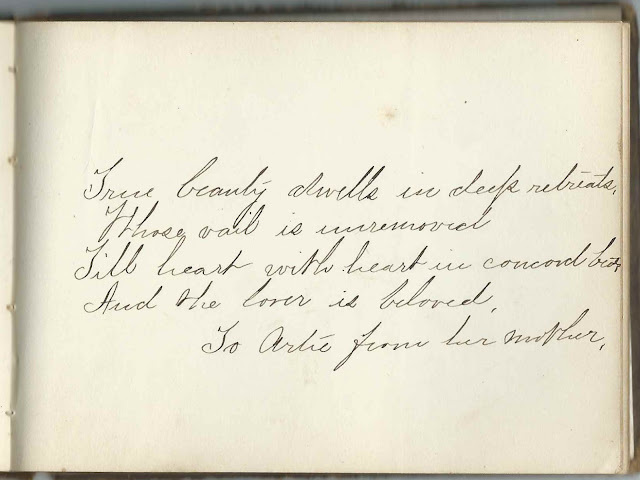 Anna Belle; possibly Anna Belle Hull of Clinton, Connecticut, whose siblings Alice and Ashbel also inscribed pages. 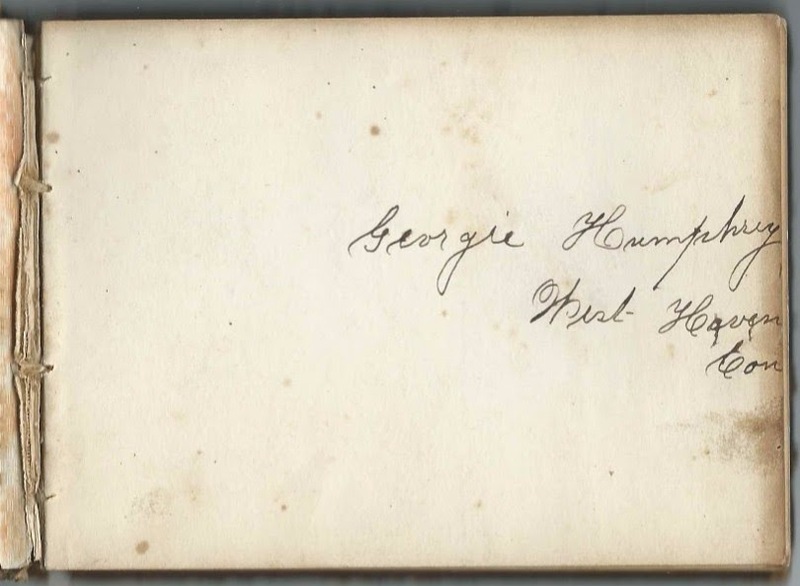 "To Artie from her mother"
Georgie Humphrey of West Haven, Connecticut; album owner. Presumably either Georgianna Humphrey (1855-1914) or George Washington Humphrey (1861-1933), but I believe the former as one page is inscribed "To Artie by her mother"
Eva H. Nettleton, stamped; the initials J. A. W. appear in brackets in lower right corner. Eva stamped another page as well, shared with the stamp of Ella Nettleton. 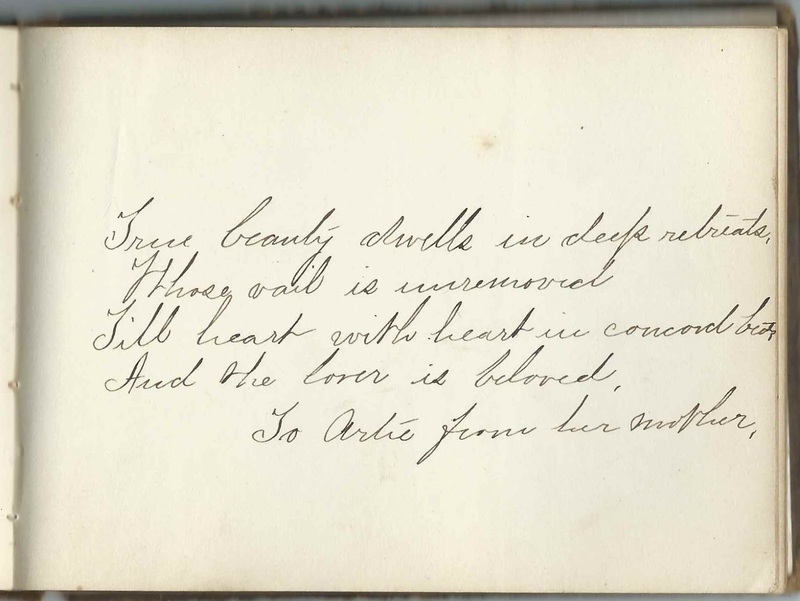 Where is this Humphrey Autograph book and where was it found?